Dubai Tamil Sangam (DTS) proudly celebrated Mahakavi Bharathiyar’s 130th birth anniversary on 23rdDecember 2011. Supported by the Indian consulate, the event honoured Bharathiyar’s unparalleled services to the Tamil literature and Indian independence by hosting “Bharathikku oru Bharathanjali” and inviting renowned dancer Kalaimamani Smt.Shobana Ramesh to be part of the Bharathanatyam concert. The graceful dancer translated and portrayed the amazing skills of Bharathi’s poetry through dance. NA: What encouraged your interest in dance? Was it an interest initiated by your family or your own interest? KR: My mother was and continues to be the main encouragement for me to pursue a career in dance. Since she felt that she could not receive an education in dance, she wanted to provide me with one. How did your journey in dance start? When was your first arangetram? The journey began in my birthplace Trichy. My father was a collector in the neighboring city of Tanjore, where I started learning dance. Two years later, I relocated to the city of Chennai where I studied dance under Guru Vazhuvur Ramaiyapillai and my first arangetram was held when I was 7 years old. Which accolade do you consider to be the most treasured for your contribution to dance? The most prestigious award I received was the “Nattiya Selvam” presented by the former chief minister of Tamilnadu MK.Karunanidhi. That same evening, I was presented with the State award “Kalaimamni” by the current chief minister of Tamil Nadu J.Jayalalitha. This was a great honor for me. What is Bharathikku Oru Bharathanjai? How important is this event to you? Ever since I was a kid, I have admired Bharathiyar poems. I believe his name should be immortalized in history, which is the main reason for this event. Most Bharathanatyam dancers are inspired by the episodes in the Ramayana and the Mahabharatha, but I wanted to use bharathiyaar’s work as my inspiration for a change. This is not very well received initially but it has gained tremendous momentum. Tamil literature is dominated by a number of poets. What are the unique characteristics of Bharathiyar’s work? When considering a poem or a story for dance the dance’s artistic value is enhanced by Navarasawhich is the nine important facial and the body expressions. In comparison to the other works in Tamil literature, Bharathiyar’s songs stand out because they contain every aspect of Navarasa.Our emotions come out greater and have more effect because of his work. Most of Bharathi’s work is seen in the form of literature or music, what made you bring it into another art form specificallydance? Prominent Indian film actor Kamalhaasan has quoted Bharathiyar’s work in many of his films. Being a fan of Bharathiyar, he has shown his admiration for my work which is inspired by Bharathi’s literature. 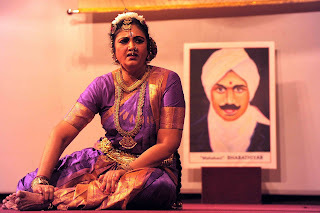 People connect with the musical version of Bharathiyar’s work and this is why I decided to inculcate his work into my dance because rather than listening, visual scenes will create more impact. Apart from your current passion of dance you have a business whose main employees are prisoners. What inspired you to take such a noble step? I believe that those people require a second chance. Once prisoners enter jail, they overcome with a lot of guilt about the crime they have committed. This business serves as redemption for these people and to make something of their lives. This is your first program in Dubai. How has the experience been so far? In comparison to places around the world such as US, UK, South Africa, where I have performed. Dubai offers me a warm and a hospitable environment. I feel like being in my birthplace. I wouldn’t mind coming here more than once. You serve as an icon for the progression for women because of your numerous activities and causes. What would be your message to the emerging crop of young women? The main quality of a woman is the ability to balance her personal life, her professional life and her contribution to the society. Being a wife, a mother, a dancer, a grandmother and a business woman makes me that icon.